Microsoft's strategy for Windows Intune seems to be to get it ready for enterprise customers. If done right, that's good news for small businesses as well. Microsoft recently announced a beta release of the second version of Intune, its cloud-based remote PC management tool for Windows PCs. The first major upgrade to the service since Intune went live this past spring, the public beta of version two adds new capabilities including third-party software distribution and remote virus scan. Microsoft's product manager has called the beta "the release to make us enterprise-ready," which is surprising for a tool that Microsoft has said it designed for smaller businesses that don't have a lot of dedicated IT resources in-house, or that lean on their IT solution provider to support computers. It's been promoted with an "enterprise IT management for the rest of us" type of message. Apparently, "the rest of us" now includes enterprise IT managers. Microsoft says its sweet spot for Intune is with companies with fewer than 250 seats. But then it also says it's making inroads with the current version at the departmental level in bigger companies. The first version of Windows Intune did a good job of handling Windows patches, but did nothing for software distribution outside the Microsoft camp, and that made it a non-starter for most enterprise PC managers. Microsoft has added third-party software distribution in the second beta release of Windows Intune. The second beta of Intune plugs that hole, introducing support for third-party software updates. Basically, anything that can be distributed as a self-installing .EXE or .MSI file can now be remotely installed using Intune, making it a much more capable tool for software management and compliance, as it can also tally the installed number of copies of Microsoft or third-party software packages installed on managed PCs. But regardless of what functionality users seek from Intune, some of the new features will play well with all users. The management console for the new version is still browser-based, but it works much more like you'd expect a well-behaved Windows app to work. Right-clicking for a context menu is one of those taken-for-granted things that you don't think of until it's not there, and it wasn't there in the first release of Intune. It is in the second. 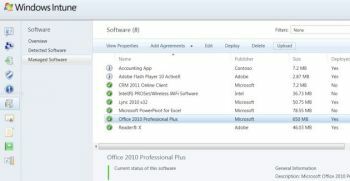 The console also has new permissions capabilities, which should be particularly of interest to small business users that outsource some or all of their PC management tasks to a partner. It allows Intune users to decide what, if any, change permissions given users will have--meaning that an enterprise can delegate monitoring to a junior IT staffer but require him to report to a supervisor if anything needs to be changed. Likewise, a small business can allow its IT solution provider to take one some or all of the monitoring and management of its managed PCs, as it sees fit. The bottom line is that from the get-go, Microsoft has promoted the tool as enterprise PC management at a small business price point. So if Microsoft wants to go deeper with the feature set to court enterprise customers, that's all well and good for small businesses. As long as Intune continues at its current $11-per-PC per-month and still includes upgrade rights to the latest version of Windows, it will continue to provide a compelling value for small business customers, who will either find new value in the new functionality or work around it. For the moment, the second beta of Intune is being run parallel from the on-sale first version, and you won't be able to run both versions on the same PC. But Microsoft says the current beta functionality will be rolled over into the mainstream product by the end of the year, part of an ongoing process of refining Intune and bringing it up to snuff for the big-business user while adding more capabilities for the existing user base at the same time.